How have you been enjoying our grilled summer recipes so far this summer? 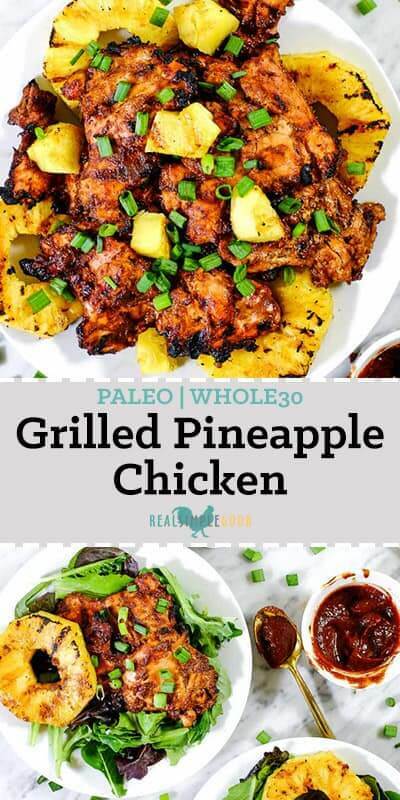 This Paleo + Whole30 grilled pineapple chicken might just be my personal favorite! 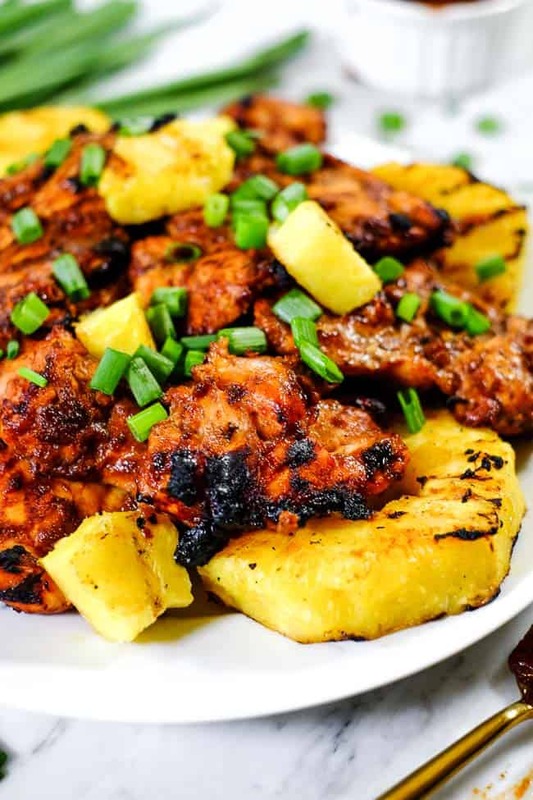 It’s got this smoky barbecue flavor, with a hint of sweetness and that grilled pineapple…does it even get any better? 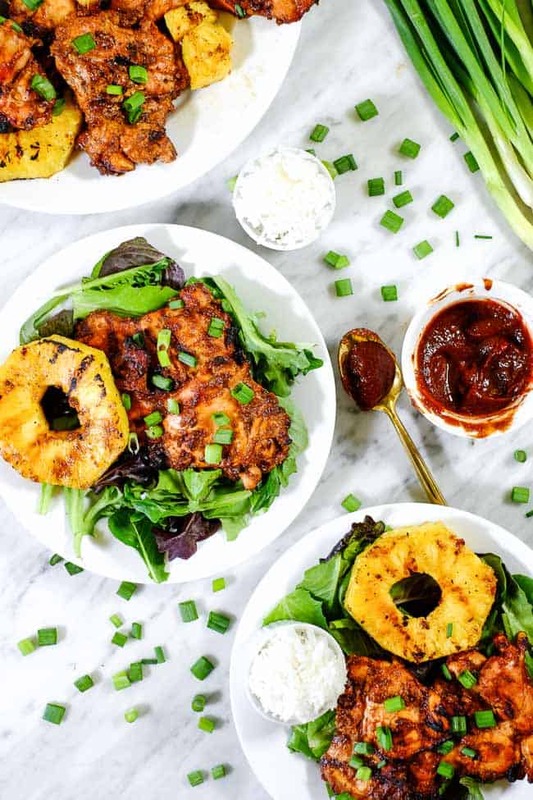 Healthy summer dinners have never tasted so good! 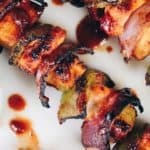 The flavor of the chicken marinade for this recipes is like a cleaned up Hawaiian BBQ sauce. It’s a little smoky, a little sweet and will have you licking the extras off your fingers! 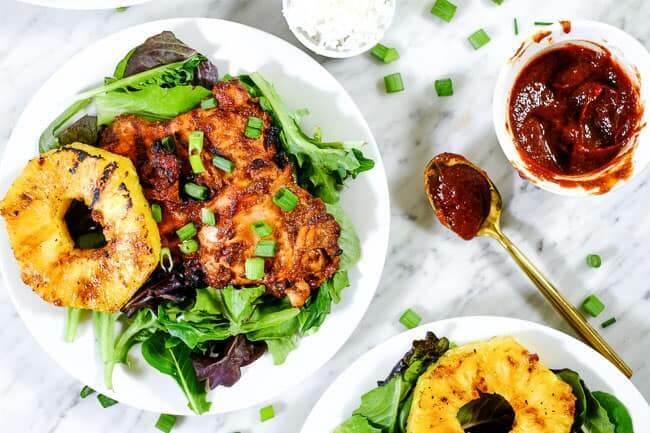 We use all real food ingredients unlike many store-bought sauces and marinades and dates are our primary sweetener, keeping this one Whole30 compliant if that’s your thing! 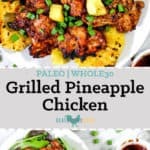 We use chicken thighs in this recipe which cook up pretty quickly, and we love grilling the chicken and pineapple on high heat and also on our Traeger wood pellet grill. The Traeger really adds a layer of smoke you just don’t get with a traditional grill. It also consistently cooks everything to perfection. I have to admit that grilling on our old charcoal grill was always intimidating to me…like I would rather heat the house up cooking with the stove/oven than try to get the charcoals going, without making a total mess. On the Traeger though, I feel as comfortable as I do inside in our kitchen. It has made cooking this summer so much more fun and enjoyable for me! We had a Traeger for several years, and then this summer our friends at Traeger upgraded our setup and sent us a brand new grill! It’s been one of my favorite parts of this summer! 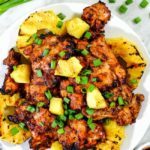 If you’ve never had grilled pineapple before, you are in for a real treat! 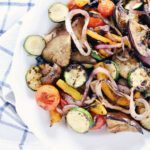 We love grilling veggies AND fruits during the summer. There is just something real special about it. 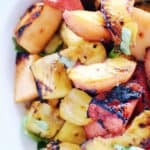 Some of our favorite grilled fruits are pineapple (obviously) and also stone fruit, like peaches, nectarines, plums, etc. We’ve also tried watermelon, cantaloupe and mango as well! 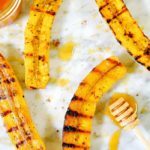 Seriously, start playing with grilled fruits – you won’t regret it! 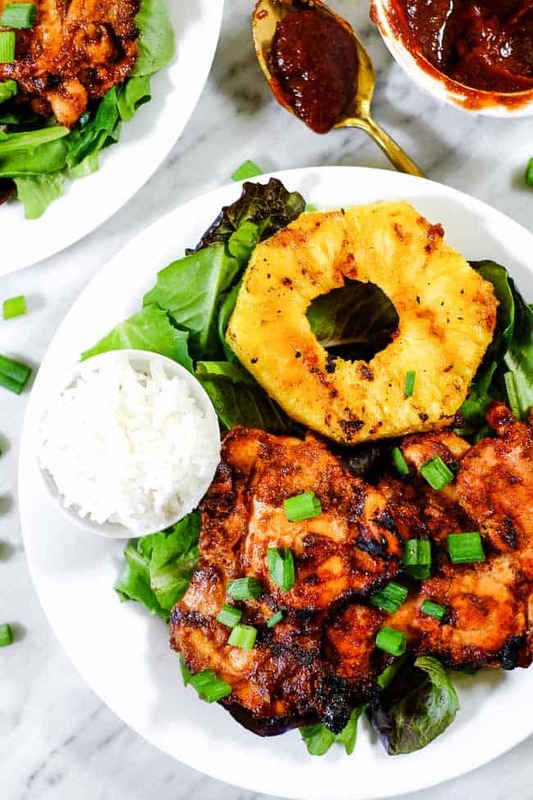 Fire up your grill and make this grilled pineapple chicken ASAP! 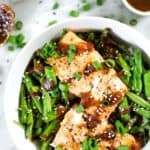 It’s super flavorful, easy to turn into a full meal and something we bet even your kiddos will get excited about! Leave a comment below to let us know how it goes! Also, take a pic and tag us on Instagram @realsimplegood, so we can check it out! We love seeing your creations, and make sure to give us a follow if you don’t already so we can stay connected! 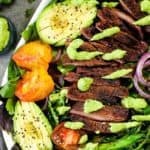 I’m doing Whole30 for the first time and made this dish last night – it was delicious! It’s something I’ll definitely make again, even when my Whole30 is wrapped up. Any suggestions if I do t have dates! I forgot them at the store and really want to make this!